Some industries rely on point-based rating systems—especially the educational industry, where APPA’s 1–5 rating is standard. You can learn more about when to use percentage-based and points-based systems here. In this guide, we’ll walk you through how to create an APPA or other point-based scales. Access your ratings: Click the “Setup” tab and then click on “Ratings” in the left-hand sidebar. This will bring up a blank form to create a new rating. Assign labels and points. Each choice has a label (for example, “Meets Standard”) and a corresponding number of points. You can add as many choices as you’d like. To delete a choice, click the red icon to the left of the row. Select deficient scores. 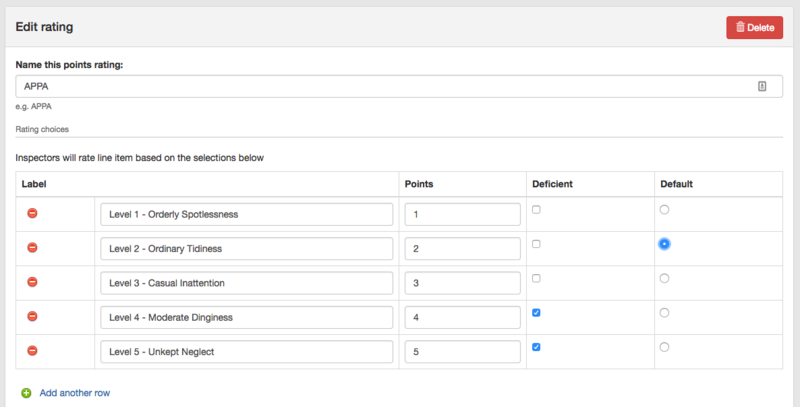 Each choice also has a checkbox that allows you to mark a certain score as “deficient,” which means the line item wasn’t done to an acceptable quality standard. Tracking deficiencies makes it easy to see when problems arise. Tip: You can set your email preferences to have OrangeQC send notifications to certain users if an inspector rates something as deficient. This is an easy way to escalate issues and make sure they’re resolved quickly. You can also see which inspections have deficient line items under "Reports." Set the default score. In the “Default” column, pick which choice you’d like the inspection form to list as default when the inspector brings up a new inspection in the field. You can only pick one option. Save your form. That’s it! 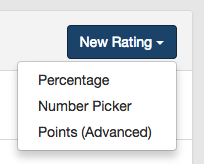 You will now be able to choose this rating system when you create a new inspection form.